As far as I’m concerned you can never have too many cookbooks. My own collection spills out of bookcases in two rooms, upstairs and down. Shelf space is at a premium, though, so I’m fairly selective about what I add to the collection these days. A cookbook has to bring something new and unique to the kitchen before I give it a home. I don’t need another compendium of Italian standards or repackaging of old cookie recipes and I’m hesitant to add a book from a cuisine I rarely cook because the ingredients are such a challenge to find. Of all the cookbooks I’ve read about, riffled through, and cooked from in 2009, these are my keepers. They range from the sophistication one expects from Thomas Keller even when he’s writing about family-style cooking, to the down home earthiness of Steve Sando, the heirloom bean guy. Any one of them would make a great holiday gift for an enthusiastic cook. 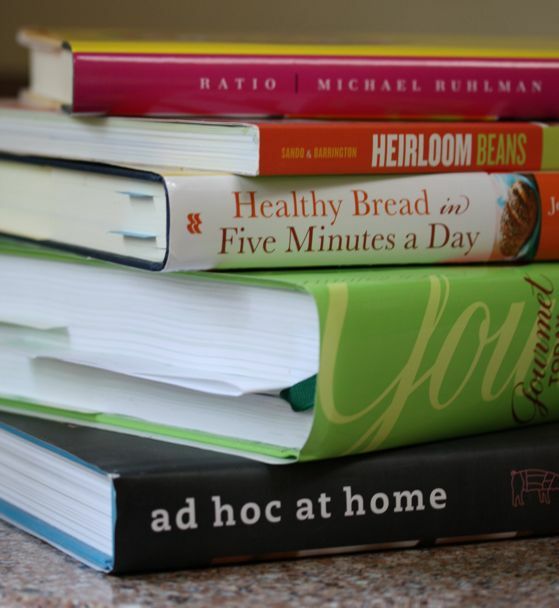 There are many more that I would like to have given a test drive, but I no longer see virtually every cookbook that comes on the market as I did back when I was in newspapers. I was so impressed with all of these that I bought them, with the exception of “Healthy Bread in Five Minutes a Day.” It’s a whole grain sequel to my favorite bread baking book of all time and I was pleased to receive a review copy. 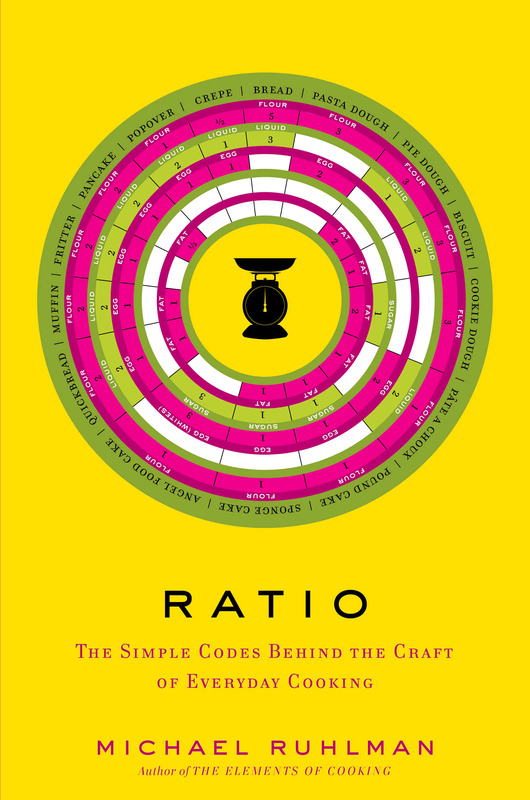 “Ratio The Simple Codes behind the Craft of Everyday Cooking,” by Michael Ruhlman (Scribner, 2009, $27). Any really ambitious cook will appreciate this book. Ruhlman, who has collaborated on Thomas Keller’s cookbooks, shares the basic formulas for everything from bread to creme Anglaise that chefs learn in cooking school. It’s the perfect springboard to creating your own recipes. Pie dough, for example, is basically three parts flour, 2 parts fat and 1 part water by weight. You do need a good kitchen scale to use the ratios but Ruhlman offers actual recipes and numerous variations on the basic recipes, too. With the ratios as my guide, I produced a good sourdough pizza crust, prepared a tempura batter for zucchini blossoms and perfected my basic vinaigrette. It proved invaluable for researching questions about baking. Curious cooks will want to keep this slender volume in the kitchen. 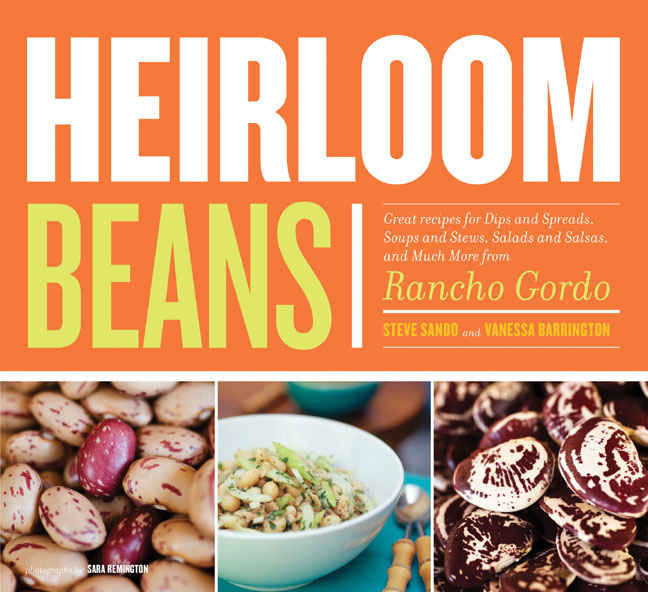 “Heirloom Beans,” by Steve Sando (Chronicle Books, 2008, $22.95). Beans may well be the perfect food for our times. They’re inexpensive, packed with protein and fiber, and offer a terrific background for all manner of vibrant flavors. Not to mention the comfort factor of a hot bowl of well-seasoned beans on a cold night. Steve Sando takes his beans seriously. He’s made it his business to save the heirloom beans of the New World and offer them to discriminating eaters. Among the beans he sells online and at farmers markets in the Bay Area are some 30 varieties with names as intriguing as Eye of the Goat, Wren’s Egg, and Rio Zape. They’re so fresh and flavorful you’ll be forced to reconsider all your assumptions about the humble legume. Even if you don’t have those exotic beans on hand, Sando’s recipes are terrific with supermarket beans. I’m a fan of “Drunken Beans,” cooked with bacon, onion, chiles, mushrooms and a bottle of lager. I made them with store brand pintos and was sad when they were gone. His basic instructions for bean cooking are foolproof as well. This is a cookbook for the frugal cook who wants the most flavor for the least expense. 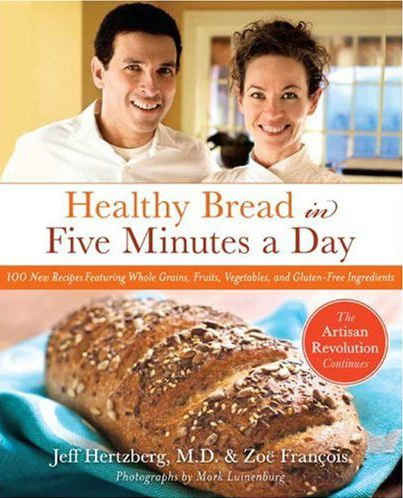 “Healthy Bread in Five Minutes a Day,“ by Jeff Hertzberg, M.D., and Zoe Francois (Thomas Dunne Books. 2009, $27.99). I was so smitten by Hertzberg and Francois’ first book, “Artisan Baking in 5 Minutes a Day” that I leaped at the chance to review this book. Their stir-it-together-and-store-it-in-the-fridge technique revolutionized bread baking in my house. No longer did I have to worry about keeping my thermostat high enough to raise dough. And I had pizza or bread dough sitting in the refrigerator, waiting to be baked off. The crust was crisp, the crumb nicely chewy. This new cookbook applies the same principles to whole grain baking and the results have been wonderful. I confess that I still prefer the earlier recipes, for the most part, but the authors have accomplished miracles with whole grains. And the results are quite tasty. The master recipe turned out perfectly the first time and I turned the 10-grain bread into rolls for Thanksgiving dinner. Cooks who are trying to eat more healthfully will want this book. 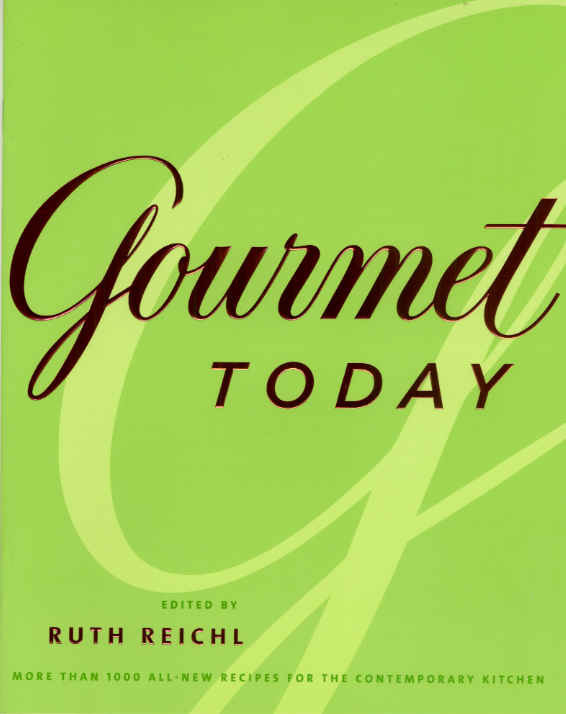 “Gourmet Today,” edited by Ruth Reichl (Houghton Mifflin Harcourt, 2009, $40). This hefty tome is my sentimental favorite this year. When word came down that Gourmet Magazine was shutting down after 60 years, I ran out to buy this cookbook because I figured it would be the last word from my favorite food magazine. The good news is that it turned out to be a wonderful cookbook, encyclopedic in its scope, and filled with recipes that I wanted to make, like the savory and sweet butternut squash risotto. None are too complicated but neither are they dumbed down. I think of it as “Joy of Cooking” for the 21st century. Here’s an eclectic collection of dishes spanning the world, from Italian seafood soup to grilled Peruvian chicken. There are jap chae, noodles in the Korean style, and taramasalata, an addictive Greek dip made with carp roe. Vegetables play a prominent role and many vegetarian entrees are included. Someone who’s beginning to explore all the international ingredients now found in regular markets would be a good candidate for this cookbook. I’m giving a copy to one of my favorite young cooks this year. 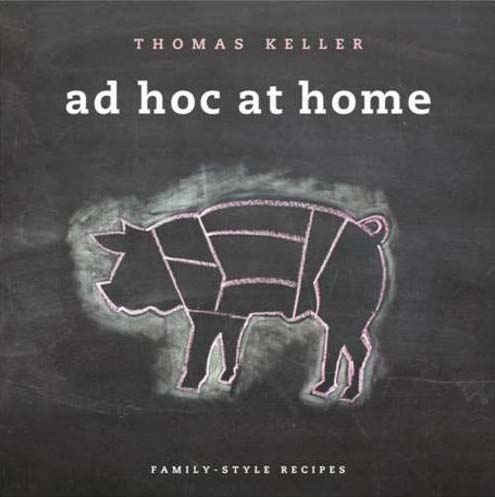 “Ad Hoc at Home,” by Thomas Keller (Artisan, 2009, $50). I’ve saved the best for last. This cookbook from the chef and owner of The French Laundry is not just another of those chef’s showoff productions filled with gorgeous photos of food you would never venture to make on your own. The photographs are magnificent, it’s true, but many of the recipes are eminently doable. Although they’re not 30-minute wonders, the results taste so good they’re worth a little effort. All are inspired by the food at Ad Hoc, the casual place Keller opened in a former diner not far from his Michelin-starred restaurants in Yountville. A number of recipes may be too ambitious for the average home cook. But others get their memorable flavors from inspired technique and careful attention to detail. “Crispy Braised Chicken Thighs” cooked with olives and strips of lemon zest get their impressively crisp skin from a pass under the broiler after about 20 minutes of braising in the oven. Membrillo – a Spanish-style quince paste spiked with star anise – bakes in the oven with minimal attention. 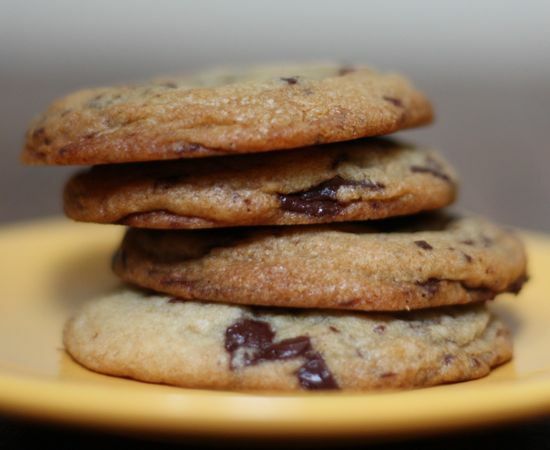 The most delightful surprise is what Keller does with that homespun classic, chocolate chip cookies. His are nothing short of fabulous, with great texture and exceptional chocolate flavor, brought into high relief with a generous measure of kosher salt. The difference comes in a few unique touches, hand-chopped chocolate, dark brown sugar, and cold butter in two additions. He uses not a drop of vanilla. I’d buy the book again just for the tips sprinkled among its oversized pages. I like the “lightbulb moments” in which Keller shares tricks such as keeping fried foods warm on racks placed on baking sheets in the oven so the food doesn’t get soggy. The photographs of Keller shaping hamburger patties, cutting fennel into batons or tying a boneless roast are very helpful. This extraordinary cookbook would put a smile on the face of any serious home cook . Preheat oven to 350 degrees with racks positioned in the upper and lower thirds. Line two baking sheets with parchment paper or silicone baking mats. Sift flour and baking soda into a medium bowl. Stir in salt. Place chopped chocolate in a fine-meshed basket strainer and shake to remove any small fragments. In the bowl of a stand mixer fitted with a paddle, beat half the butter on medium speed until smooth. Add brown sugar, granulated sugar and the remaining butter and beat for a few minutes, until the mixture is light and creamy. Scrape down sides of bowl. Add eggs one at a time, beating the first until well incorporated before adding the next and beating. Scrape down sides of bowl if necessary. Add flour mixture and mix on low speed to combine. Mix in chocolate. Remove bowl from mixer and fold the dough with a spatula to be sure the chocolate is evenly distributed. Using about 2 tablespoons per cookie, shape dough into balls and place on prepared cooking sheets about 2 inches apart. The dough will spread as it bakes. Bake for 6 minutes, then rotate and switch the positions of the pans. Bake about 6 minutes more, until the tops are no longer shiny. Remove from oven and let cookies cool for about 2 minutes on the pans to firm up a bit before transferring them to wire cooling racks to cool completely. Note: Keller prefers to use Billington’s molasses sugar, which is available at Wholesome Sweeteners. Aleta: Thanks so much for the kind words. People can still come to our blog with bread questions, at http://www.healthybreadinfive.com.